Neutral walls! You’ve gotta love them! And I sure do! I have painted my walls so many colors over the years. Golden Rod Yellow, Pepto Bismal pink, Greens and Blues and Browns and almost every other color of the rainbow. About seven years ago we started transforming our home one room at a time and painted each room a beautiful soft neutral or white. I’ve learned a lot about painting walls and shared my top 6 TIPS FOR FINDING THE PERFECT PAINT COLOR here. 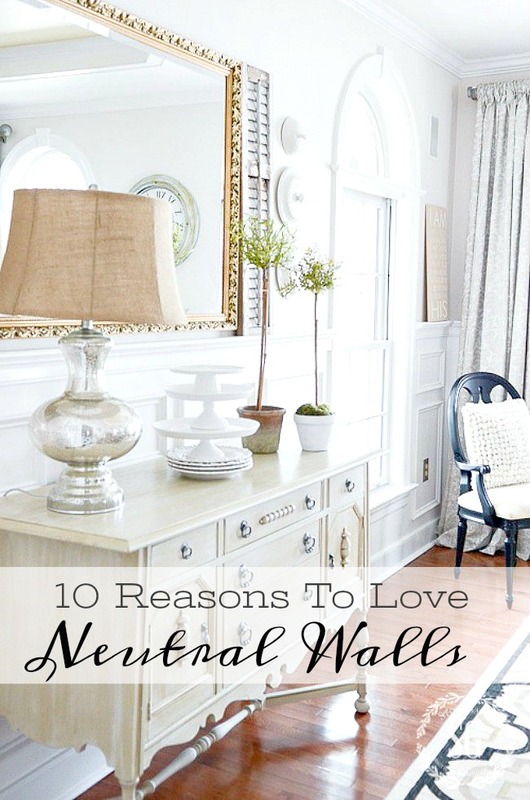 Today I’m sharing why I love NEUTRAL WALLS! I’m going to take you on a little tour of some of the rooms in my home to show you how neutral walls work wonderfully with my decor! And I bet they will work with yours too! Neutral walls give you so much freedom when it comes to decorating. You can transform your home from coastal to country to contemporary with only changing out accessories. Only neutral color schemes allow for this. 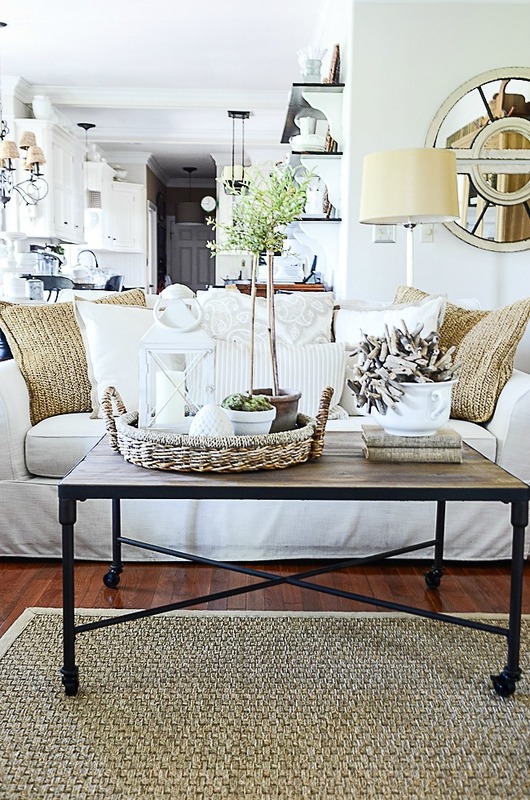 I love how a neutral color can warm up or cool down a room.This fact should not be overlooked! It is such a simple choice, but one that can bring such a big impact to a room. No overpowering choices here. My home is decorated with mostly warm tones. So my wall color is a warm neutral and my trim is a crisp white. Read 6 TIPS FOR CHOOSING THE PERFECT PAINT COLOR to see StoneGable’s wall and trim colors. When you have neutral walls, you don’t have to rush into a commitment with other decor colors. You can slowly introduce pops of color until you decide if you love them or not. If you decide you don’t, a new pillow cover can often be changed out and fix it all! It’s hard even for me to commit to a new color, but I’m bringing back a dark blue into the family room. Years ago I tried blue when my walls were a dark tan and it really looked dull and tired. Thankfully I don’t have to worry about the wall color this time around! 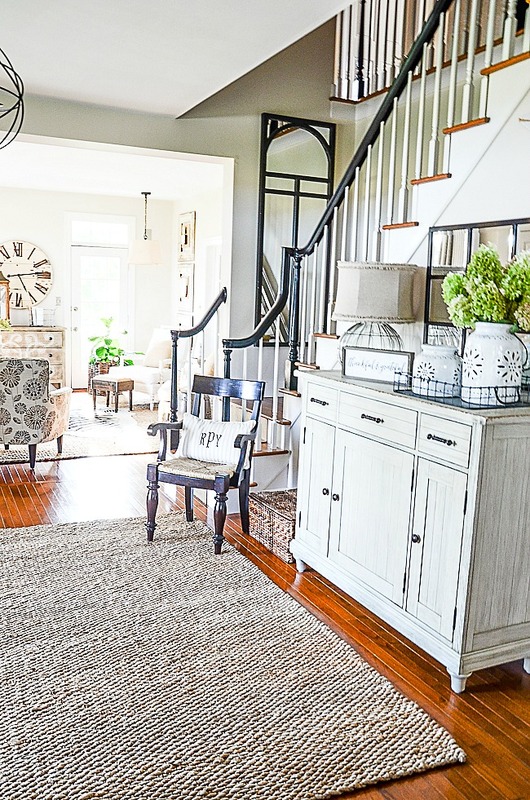 You might like to read NEW COLOR PALETTE FOR THE FAMILY ROOM. When or if you ever decide to sell your home, having neutral walls helps your home appeal to many tastes. Often folks can envision their own furniture and artwork in your space. They also appreciate not having to repaint walls when they move in. I can’t bear the thought of not living at StoneGable. But someday I’m sure we will have to say good-bye to this very special home. Selling it will be easier with a neutral backdrop. The walls in this bedroom are Simply White by Benjamin Moore. 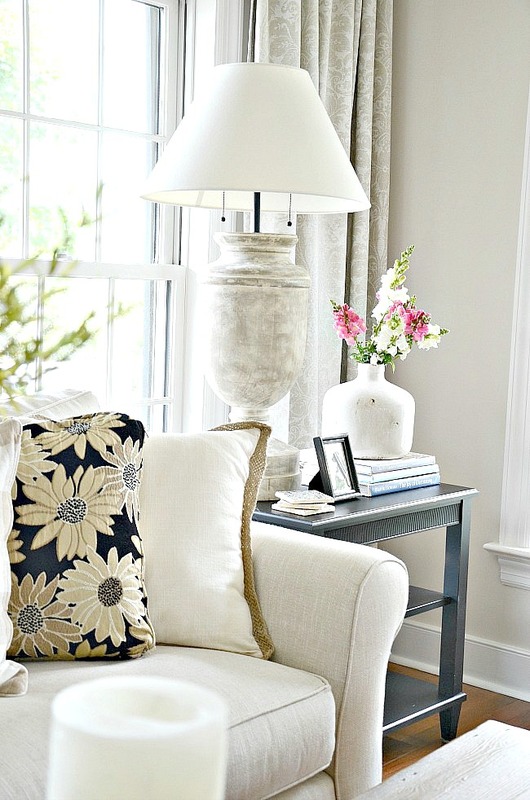 Neutrals are visually restful and serve as a relaxing background in your space. 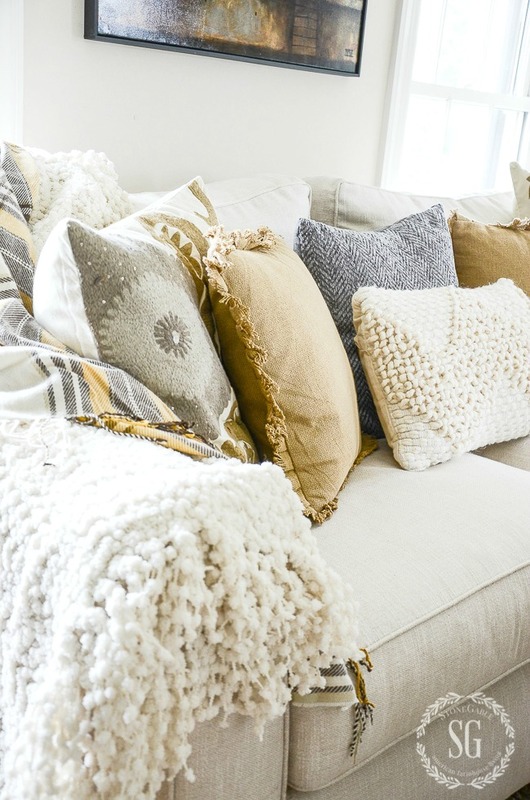 A neutral wall is a blank canvas and your accessories like throw pillows, blankets and artwork help to create your masterpiece. Most of the time we don’t want our walls to be the feature of a room. We want our treasures to shine! When you have neutral walls in your home, anything that you add to the space just pops. Maybe it is a beautiful piece of furniture with ornate lines or a favorite pillow and throw. Even lamps totally make an impact in front of a neutral wall. 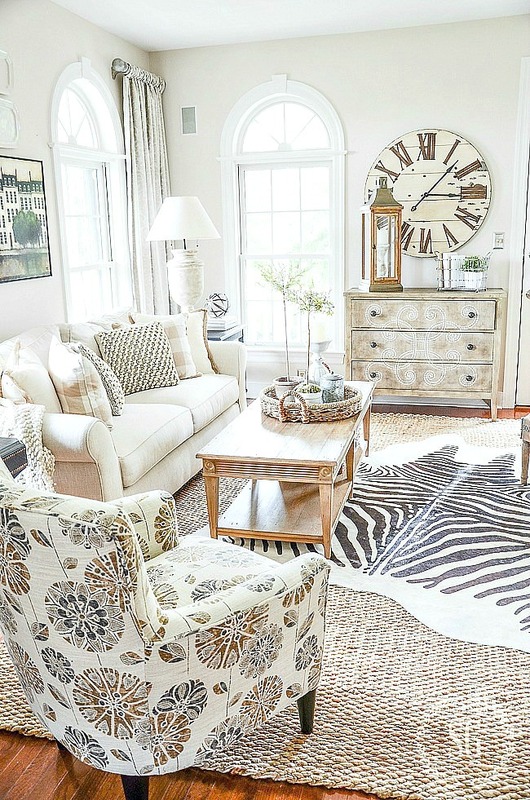 When your walls are a neutral color, home decor items and furnishings create a sense of depth. Rooms can appear larger than they really are and spacing furnishings is a little more forgiving as well. 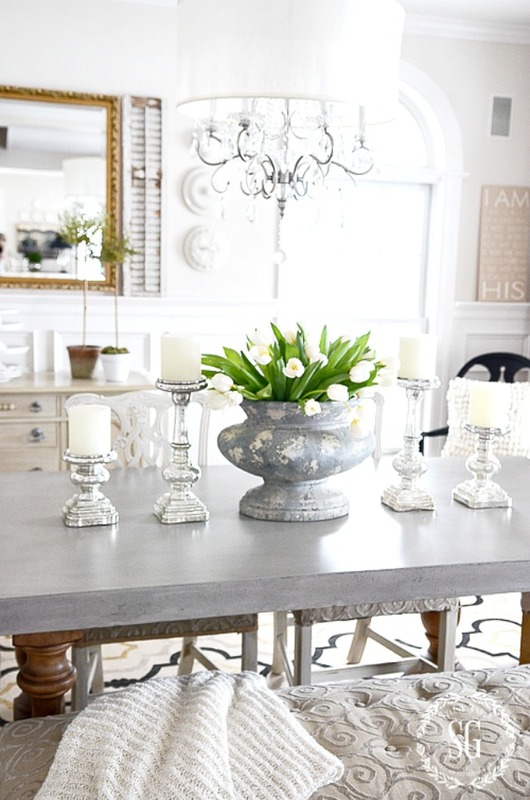 My dining room has lots of depth and the neutral walls don’t close in the spacious look I love! 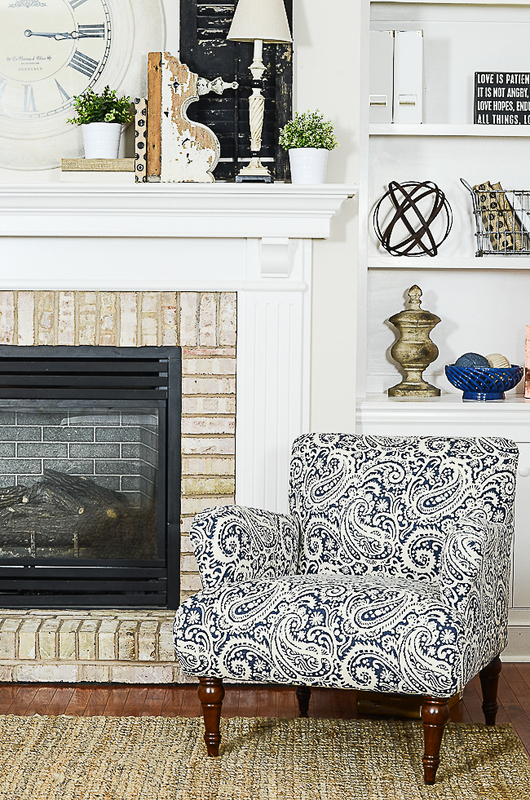 Patterns and textures play a big role in the aesthetic of your home. When you have neutral walls, there is more opportunity to incorporate different patterns and textures without them being too overpowering. I’m obsessed with texture to make a room interesting. And I’ve gotten a little more adventurous with patterns I love having neutral walls that don’t fight with what I’m adding to make a room pack a punch of pretty! Finally, neutrals are just classic which is a bonus. You won’t feel the need to repaint your walls every time your tastes change and that saves your sanity and helps your bank account, too! Colors come and go but neutrals are always in style! I’ve redecorated our Gable guest room three times from the floors up. The walls have been Sienna and peach (ugh) and finally Simply White by Benjamin Moore. So no matter what new decor or style I want to add to a room in the future I’ll be keeping the neutral walls! 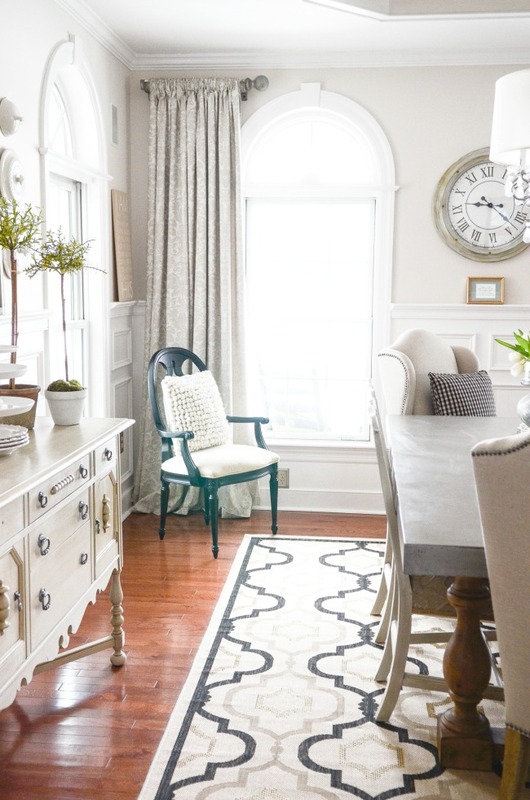 See my Gable room makeover HERE. I love living with neutral walls. They are the perfect subtle background for living at StoneGable! How about you? Do you love neutral walls? I’d love to hear what you think! Thanks for all your wonderful posts! Yvonne, your home is just beautiful! Enjoy! Your home is absolutely stunning and an inspiration, from when I was first introduced to it at the Cottage Journal and currently enjoying your amazing creativity on your blog. 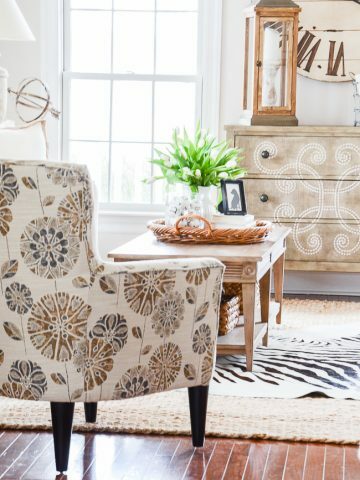 We moved to a neutral home because we love to change fabrics and accessories for the seasons, of which my husband says we now have 7 seasons at our house! A calmer palette is like a breath of fresh air. I’m new to your blog and happened on it by accident. So glad I did. Could you tell me about the cream colored carpeting in the bedroom above? I am not able to have hardwood floors and it’s near time to replace our carpeting. It’s the first carpeting I’ve seen in a long time that I really like. Thank you. We were told one our houses wouldn’t sell because the walls weren’t neutral and the other because we didn’t have granite counter tops and stainless steel appliances. Guess what? Both sold in a few weeks! People will customize the home to their own taste no matter what. Do you like Sonnet or Simply White best? Why did you use the two different wall colors? Sonnet is the wall color on my main living areas and hallways. I love Simply White for my bedrooms and Office. Love each and every room…thinking of you and hope you are well! what do you achieve with a hint of yellow? I confess I do not know paint or colors. Nan, a hint of yellow will give you a warm tone. My paint color is warm. I hope this answers your question. 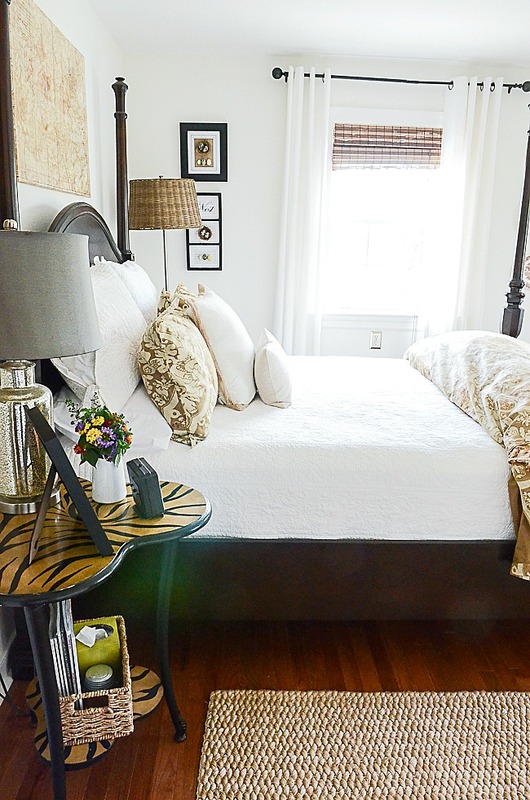 I have always kept my rooms painted in a soft while, cream or linen. Being military, we moved often and I wanted a quick sale. I knew regardless of taste, anyone could move their furniture into our house and paint at a later date, if they choose color. I always thought I would saturate my forever home but found I prefer the same warm neutrals for all the reasons you have shown. Oh Yvonne I totally agree with you on neutral!! I haven’t used white but a neutral with a hint of yellow and white ceilings and a lot of stained wood trim. I feel like I can do anything with decor for all the great reasons you stated! Love neutral! The more I see neutral walls, the more I want them! I think if I built a new house I would go with white walls. Thank you for this post! I, too, enjoy light! Walls, sunshine. Please help me with this question – I have white walls in my kitchen with natural wood on the bottom half of the walls, the room is the size of a postage stamp – not going to change and WE have done many things here to make it a hard working kitchen. It is home! My question, I want to repaint the existing white walls and ALSO paint the cabinets white (cabinets on one wall ONLY), do I the same color, type paint on walls and cabinets? IF, varying shade, type of paint what do we paint WHERE? Wanna a cream not white, white. Thank you. Hi Nan, paint is like magic! I’d paint the kitchen cabinets white and the walls just slightly more creamy but not too yellow. I know you don’t want to paint anything else but think about painting the natural wood too. It will make such a difference.Send me a picture when you are done! Love love all you have done in your home. 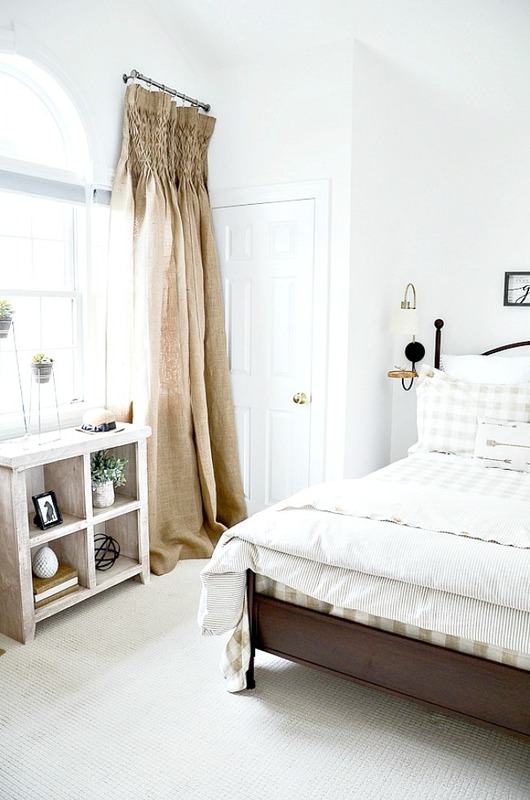 How did you get the pleats in your guest room on the burlap curtains. That is so different!!!! Hi Kathy, the curtains came that way. Gotta love smocking! I also have always had neutral walls. I find that I tire of different colored walls very, very quickly. To me the different colored walls get a dated, too-trendy look so fast and then just look ridiculous. 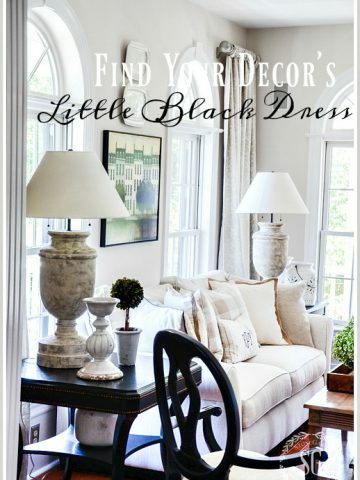 You are so right in that neutral colored walls allow so much diversity and creativity in the rest of your decor. 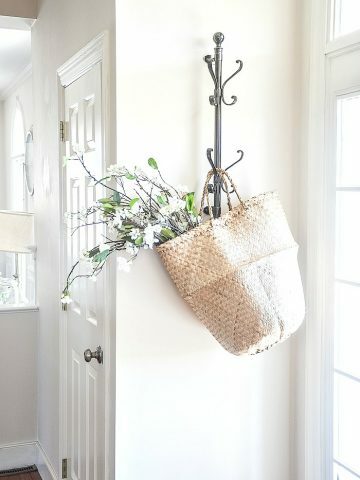 Besides neutral colored walls allow unique art work or your special decorations to shine and be really showcased, instead of your attention being drawn to a glaring, attention-seeking colored wall. I agree with you 100% about neutral colored walls! Lovely. Thanks for sharing your immense talent. I’m in the process of repainting several wallpapered rooms and am going with soft neutrals, mostly in the warm gray tones or goldy beiges. I have subtle patterned dark mulberry colored wallpaper in my front entry that I still love and am torn about removing it. But all other rooms are soft neutral colors. Including our dining room which is BM Victorian Mauve, a muted lilac and BM Carrington Beige. It’s just so serene and looks like spring on even the dreariest of winter days. The soft colors allow artwork and textiles to be the stars of the room, not the walls themselves. 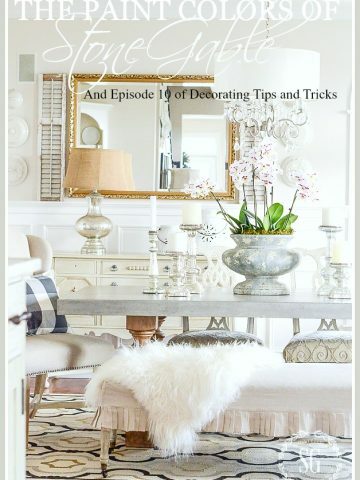 Amazing points to consider when decorating! I’m using a lot of these reasons in my new house. I totally agree with Bunny’s comments! You are my new go-to decorator! Enjoy your week and have a blessed Easter, Yvonne! Yvonne, I am with you on this topic. As we begin all things spring cleaning, I have added painting our interiors. I am thinking ivory. My husband is not to keen on it. We have two dining rooms and the smaller one is the most used and intimate. It has color and wont be changed. I will use your two articles on the matter to gently persuade my husband. We are not ready to move but I do think it is better for resale, too. Resale is the number one reason I am repainting the walls of our home. It will happen sooner than we both wish and we did not want to have to delay the sale by having someone being turned off by the paint colors. Of course you are so correct on all the other reasons. I know! We have lived at StoneGable for 23 years and I know someday we will move but it is so sad to me! Don’t know if you have thought about or maybe it’s in the process of, writing a home decor book. You have so many beautiful photos and a wealth of design info. Have you already written a home decor book? I would certainly buy if you have. While reading your posts, ur blog for almost 2 years, I’ve come to rely heavily on your blog posts for guidance. I never read blogs at all until I had major back surgery almost 2 years ago. I started reading during a very long recovery period. I didn’t even know what blog was then. And boy, did I discover I had been missing out! Anyway, back to a book. If case you haven’t written a book, I’m following you on Pinterest too so I have all your pics and design wisdom in one place. I will be needing as my daughter and her family have moved from our home into a townhouse. Essentially, I’m starting over with everything. My husband and downsized to Two Small Bedrooms upstairs. We now have a blank slate as in completely empty blank slate downstairs. Diane, about the book, yes I am writing one… for 3 years. Due to a few unexpected surgeries, it has been on hold. But this week on my to-do list is to write 10 pages. So the process begins! I hope you enjoy your downsized home! Although, I use color on the walls of my home, I can certainly appreciate the appeal of neutrals! Stone Gable looks lovely with its neutral color palette, and your explanation of why it works is very convincing. I enjoy your 1, 2, 3…”bullet point” way of writing about a subject. It makes the topic so easy to digest. Who would ever guess you taught school? Your previous vocation serves you well as a successful blogger! You know my years as a teacher has served me well as a blogger and writer. Who knew? Oh, thank you Kim! We LOVE podcasting together. Did you know that we hit the 1,000,000 download mark last week? Sooooo fun!